I know that it's been a while since the last Book Club review but I just needed a break to not write about James Bond for awhile. Sometimes it's nice to take a healthy break between features and now I'm ready to submit the latest review in the collection. 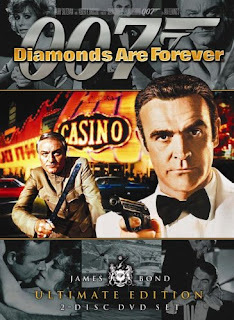 Today's review will be on the diamond smuggling adventure: Diamonds Are Forever! The Story (novel): Set months after the events of Moonraker, agent 007 James Bond is informed by M of a new smuggling ring that spans from Africa to the United States. His adventures take him deep undercover as a diamond smuggler Peter Franks to uncover the head of the conspiracy and to see how far this operation truly goes with The Spangled Mob. At Bond's side is ex-CIA operative Felix Leiter, Bond's superior M and the alluring yet witty diamond smuggler Tiffany Case. The Story (movie): James Bond continues on his search for revenge against the nefarious Blofeld for murdering Bond's wife in the previous film. Believing Blofeld to have met his end in the opening film sequence, Bond is brought to Las Vegas to go undercover in a diamond smuggling operation. Taking the identity of smuggler Peter Franks, Bond meets his contact Tiffany Case and is soon brought into the smuggling operation but all is not what it seems. The diamonds are merely a ruse to an even more calculating plot that involves a satellite, lasers and the return of a familiar foe. Aiding Bond in his adventure in Sin City is Bond's superior M, the intellectual Q, quick-witted Moneypenny, CIA agent Felix Leiter, Sultry Plenty O'Toole and the unconventional yet sarcastic diamond smuggler Tiffany Case. When looking at the plotlines for both the film and the novel, they more-or-less follow the same story arc. Bond takes on a fake identity to deceive Tiffany and be brought into the fold of the smuggling ring. While the novel has a stand-alone plot with new foes that are affiliated with SMERSH, the premise is its own motivation with a different end goal. 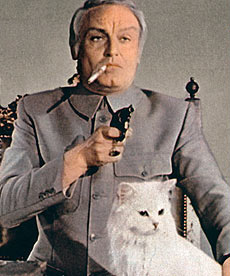 The movie, however, is still associated with the Blofeld storyline as the premise weaves itself with a conclusion relating to a Bond vs. Blofeld confrontation. They both sound good in comparison but I'll explain my thoughts on this later on in the review. The character of Tiffany Case is one of the biggest contrasts between both pieces. In the movie, Tiffany is more confrontational and outspoken in her dialogue with Bond. She takes no prisoners and expresses her thoughts with assertion and sarcasm making her easily a fan favourite. In the novel, she still is outspoken and witty but her demeanor exudes seduction and sultriness with each retort. It all depends on your point-of-view: Tiffany is more sultry in the novel depicting a blonde bombshell but in the movie, she's sarcastic and assertive as a fiery red-head. Another comparison is the difference in the dynamics of how the story is set up. What I mean by this is, in actuality, this story is the fourth Bond adventure to have taken place according the Fleming timeline but it's completely different in the film series. This film story is now a Blofeld addition when, in retrospect, Blofeld doesn't appear till MUCH later on in the novels so it was interesting to see how drastic the change can be by adding one character to the conception of the story. I don't ever want to leave the final decision as a tie even if I wasn't particularly fond of either pieces. 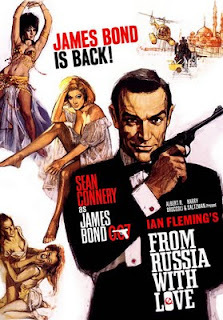 Before I had read the book, I liked the movie and there were some interesting portions such as the characters (i.e., Tiffany, Plenty O'Toole, Mr. Wint and Mr. Kidd), the action and it being a good end to Sean Connery's tenure as James Bond. My biggest problem with these two pieces is that (with the exception of the diamond smuggling aspect) I had no idea what was going on. The pages didn't come alive for me this time around and I just wanted to finish the novel. The storyline took a lot of turns to a conclusion that was anticlimactic and the same could somewhat be said for the movie as well. The diamonds I understood but the portion with the laser came from left-field as an add-on to Blofeld's tactic; the entire "villain plot" reminded me so much of Die Another Day. Without having read the novelization for that movie yet (I'll respond back to this point once I've completed that review), I think that Die Another Day used the plot device and laser better. NEXT: The next book on the list has been regarded by fans as one of the favourite stories in the series. It's going to be the espionage-filled tale: "From Russia, With Love!" Truthfully, I have actually finished reading the story and have currently moved on to a separate book outside from the series to give people time to catch up or to give me some time to draft the next review.